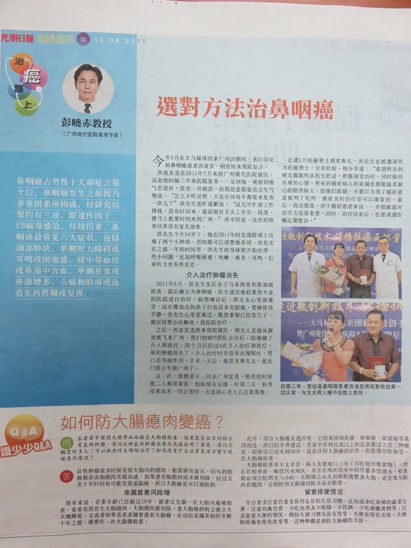 In May 2015, during the time when the Malaysia media delegation visited Modern Cancer Hospital Guangzhou, Indonesian nasopharyngeal cancer patient ANG LIM HUAT came back to Modern Cancer Hospital Guangzhou for examination. After taking treatment in Modern Cancer Hospital Guangzhou in 2011, ANG LIM HUAT’s tumor disappeared. ANG LIM HUAT is 54 years old; he found that there were two lumps on his neck in 2011. Actually, there had been something wrong with ANG LIM HUAT since 2010, he suffered from symptoms like dyspnea, cough, phlegm, tinnitus, hearing loss, etc. In June 2011, ANG LIM HUAT went to Malaysia and Singapore for examinations, results showed that he got nasopharyngeal cancer. Local doctors suggested him to take professional treatments as soon as possible. Although ANG LIM HUAT and his family were upset about his condition, they tried their best to look for better hospitals and treatments. After investigation, ANG LIM HUAT chose to take treatment in Modern Cancer Hospital Guangzhou. According to his medical report, the MDT (Multiple Disciplinary Team) made him a therapeutic plan: interventional therapy +radiotherapy. Four months later, after receiving four sessions of interventional therapy and radiotherapy, his tumor disappeared. During the treatment, ANG LIM HUAT did not suffered from side effects like vomiting, poor appetite, etc. ANG LIM HUAT and his wife even took a bus to travel around Guangzhou at the second day of interventional therapy. Accompanied by his wife, ANG LIM HUAT came back to Modern Cancer Hospital Guangzhou for reexamination. They felt nervous when waiting for the result, because they worried about the recurrence. They felt relieved after knowing that there was no recurrence.